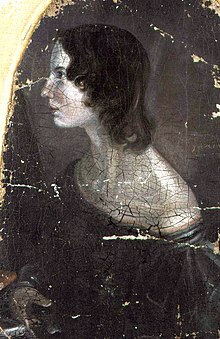 Emily Jane Brontë (/ˈbrɒnti/; 30 Julie 1818 – 19 December 1848) wis an Inglis novelist an poet, best remembered for her anly novel, Wutherin Hichts, nou considered a classic o Inglis leeteratur. Emily wis the third eldest o the fower survivin Brontë siblings, atween the youngest Anne an her brither Branwell. She wrote unner the pen name Ellis Bell. ↑ The New Encyclopædia Britannica, Volume 2. Encyclopaedia Britannica, Inc. 1992. p. 546. This page wis last eeditit on 23 November 2014, at 12:25.